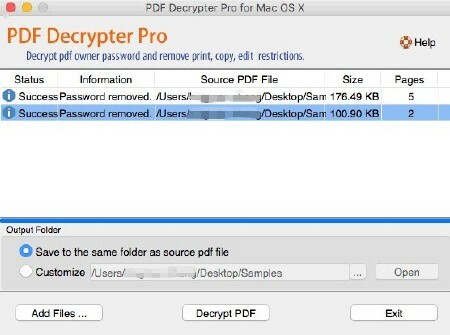 PDF Decrypter Pro может быть использована для расшифровки защищённых PDF файлов, файлов, которые владелец запаролил, предотвращая редактирование (изменение), печать, выбор текста и графики (и копирование их в буфер обмена), добавление / изменение аннотации и полей формы. Пароль на редактирование и печать снимается моментально. Расшифрованные программой файлы могут быть открыты в любом приложении для просмотра PDF-файлов. Поддерживаются все версии Adobe Acrobat! Для работы программы Adobe Acrobat или Reader не требуется! Расшифровка защищенных Adobe Acrobat PDF файлов, снятие ограничений на печать, редактирование, копирование. Моментальное удаление настройки безопасности зашифрованного файла. Поддержка расшифровки включая 40-битный RC4, 128-битное RC4, AES, сжатых файлов и метаданных. Поддержка Windows 10/8/7/Vista/XP/2003/2000 (32bit и 64bit). Do you have such kind of experience that a PDF (Adobe Acrobat) file Can not be printed, copied, or edited ? If yes, This is because PDF file has had password security and other restrictions added. The PDF Decrypter Pro can help you Remove the password and restrictions in a few seconds. PDF Decrypter Pro is a lightweight extremely easy to use application designed to help you rapidly remove usage restrictions from PDF files. Most PDF documents have 'owner password', rendering them uneditable. This small application helps you eliminate restrictions in relation to printing options or text and graphics selection. Removable restrictions also refer to changing or adding annotations to the PDF file's content and you can also add form fields that weren't in the original file. The user interface is clean and comprehensive, grouping only the buttons your need to complete the main purpose of the software utility. In addition, there is no limit to the number of files you can add to the list in the main window of the app. There are several types of encryption that this small application can remove. PDF Decrypter Pro enables you to eliminate 40-bit RC4 decryption, 128-bit RC4 decryption, AES decryption. Furthermore, you can lift editing restrictions from compressed files and unencrypted metadata. This application does not require the installation of any third party applications, also supporting all versions of Adobe Acrobat. Overall, PDF Decrypter Pro, must be appreciated for its efficiency and punctual algorithm, allowing you to remove any editing limitations from your PDF documents in a matter of seconds.